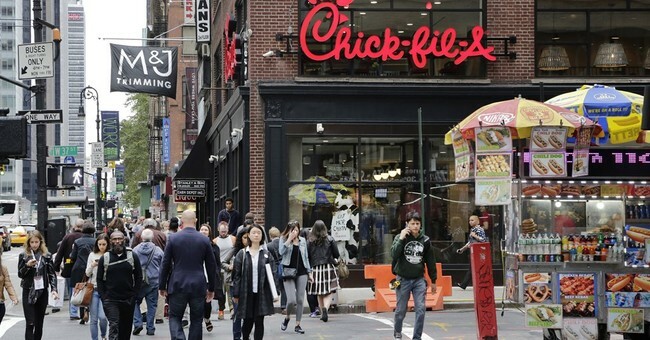 A university dean has resigned after her school doubled down on its decision to ban Chick-Fil-A from the campus on account of the restaurant chain’s conservative Christian values. Cynthia Newman was, until recently, the dean of the College of Business at Rider University. In an exclusive interview, Newman told Campus Reformthat her decision to resign was about more than just students not getting the food options that they were hoping for. Her resignation was instead ultimately due to a university statement denouncing Chick-Fil-A’s corporate values--values that are based upon the Christian faith--which also happen to be her own personal values. "I felt like I had been punched in the stomach when I read that statement," Newman told Campus Reform. "I'm a very committed Christian and Chick-fil-A's values -- their corporate purpose statement is to glorify God and to be faithful stewards of all that's entrusted to them and to have a positive influence on everyone who comes into contact with them -- and I would say that that mirrors my personal beliefs perfectly. And so I really felt it very personally." But Newman also said she’s not one to typically make a big deal out of such things. So she initially reached out to university officials privately, asking them for an apology for what they had said in their first email. The university, however, doubled down. In another campus-wide email, school officials defended their decision to ban Chick-Fil-A, and this time included a number of talking points on inclusion, to be used when confronted with someone who disagreed with Rider’s decision. Newman said that for her, that was the final straw. The dean stated she could no longer support the university in “good conscience,” because she is a Christian and the university was implying that people who hold Christian values are not responsible citizens. On February 14, Newman announced she was resigning. As some of you already know, I am a committed follower of Jesus Christ," Newman said in her announcement. "As such, I endeavor every day to do exactly what Chick-fil-A puts forward as its overarching corporate value: to glorify God by being a faithful steward of all that is entrusted to me and to have a positive influence on all who come into contact with me." Interestingly, Newman received a significant amount of support from Rider’s faculty and staff for taking a stand and demonstrating that "no one group's opinions, values, beliefs, should be elevated over anyone's else's...we should be able to respectfully disagree...we shouldn't be putting down one person's values because they don't align with our personal values." "You're the one who has to live in the world that's around you," Newman said, "and so if you feel something is not right in that world, you have an obligation to stand up and to say what your perspective is on that."